CHICAGO -- It's going to be tough for Jennifer Gordon's baby to top his or her first gift to mom and dad. Wednesday, the very pregnant Chicago Bears fan announced that her belly will bear the logo of an online auction company in exchange for two 50-yard-line tickets to the Super Bowl. The 35-year-old Chicagoan put her abdomen out to bid for tickets to see her beloved team. On Sunday, she'll pull up her favorite Bears jersey enough to show the brightly colored logo of ubid.com. Gordon said more than 200 businesses around the nation inquired about her belly ad-for-tickets offer. "I am thrilled and proud to select a Chicago-based company for the sponsor opportunity and am grateful to uBid.com for making my Super Bowl dreams a reality," said Gordon in a press release announcing the decision. uBid.com is using the deal to launch what it describes as the largest 'baby pool' in the U.S. Visitors to the site will win a host of prize packages by guessing the exact date, time and weight of baby Gordon's impending arrival. In addition, Gordon will keep a blog of her Super Bowl adventures and pregnancy for uBid. Distributed by Internet Broadcasting Systems, Inc. The Associated Press contributed to this report. All rights reserved. Dogs are to get a beach of their own on the sun-kissed Mediterranean island of Cyprus. 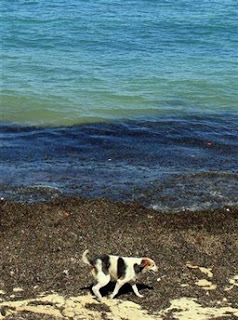 Dogs are strictly prohibited from the holiday island's shoreline to keep the beaches clean for bathers, but Cypriot authorities have decided enough of the dog's life. They are looking for suitable beaches where people and their pets can enjoy the sun and sea without falling foul of other beachgoers. The Ombudsman, a commissioner usually tasked with upholding human rights, recommended to authorities last year that dogs should get their own bathing space, the daily Phileleftheros reported.